Perth Scorchers defied Brett Lee's heroics to beat Sydney Sixers off the final ball and win the Big Bash final. With Perth needing one run from three balls to complete a chase of 148, Lee, in his final match before retirement, took two wickets in two balls. Yasir Arafat should have been run out from the final ball, but Sydney skipper Moises Henriques fumbled the throw. Henriques earlier made 77 in the Sixers' 147-5, with Shaun Marsh's 73 the mainstay of the Perth pursuit. 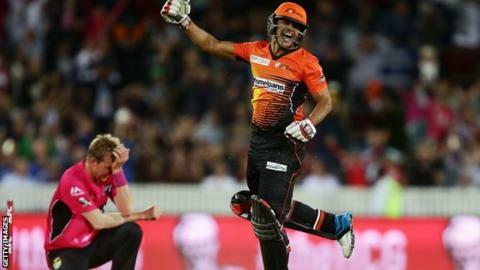 The Scorchers, the defending champions, looked in complete control of their run-chase when openers Marsh and Michael Klinger shared 70 but, when Lee had Klinger caught in the deep in the 12th over, the Sixers fought back. With 17 needed from 12 balls, Marsh holed out to the off-spin of Nathan Lyon, leaving England batsman Michael Carberry to face Lee's final over with eight required. A scoop for four seemed to have the match sewn up but, when Carberry lost the strike with three balls remaining, 38-year-old Lee, who took 310 Test wickets for Australia, set about writing a final, dramatic chapter to his career. Nathan Coulter-Nile and Sam Whiteman were bowled in consecutive deliveries to put Lee on a hat-trick that would have forced a super over. A dot ball would have also taken the final into added time. With Arafat on strike as the field converged, the ball was hit to Michael Lumb at cover. His throw to Henriques at the non-striker's stumps arrived well before Arafat, but Henriques fumbled let the Pakistani home and gave the Scorchers the title. It was cruel on Henriques, who had rescued his team from 49-4 in a stand of 98 with Ryan Carters, a Big Bash record for the fifth wicket.